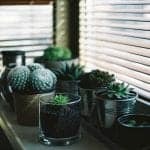 Are Your Windows Safe For Kids? 16 Nov Are Your Windows Safe For Kids? Do you windows need a child safety checkup? Do Your Windows Need a Child Safety Checkup? Are you a parent-to-be preparing a nursery? Have a curious toddler who gets into everything? Perhaps your a grandparent that has your grandchildren come visit. Child safety is something that affects all of us at one time or another. Even if you don’t have kids at home, many of us will have little ones visiting for the holidays or weekends. Children and window cords don’t mix. 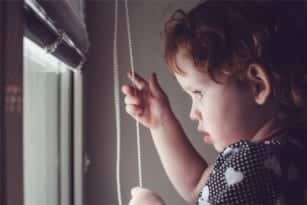 When window cords are within reach of small children, these seemingly harmless products may become strangulation hazards. Our expert installers ensure all Blinds have warning Labels and importantly correctly fitted with safety devices and are compliant with the Australian Child Safety Standards, leaving you reassured your blinds have been completed and installed correctly by the professionals. Every year we hear the tragic news of a young child loose their life through strangulation due to unsafe blind chains and cords. This can be avoided as its absolutely preventable by following some simply tips and ensuring your blind cords and chains are secured with a cleat. 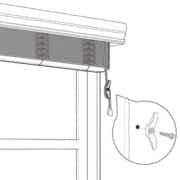 (also known as a tie down clips) Here at Shutterup, every corded Blind is installed with cleats/tie downs. 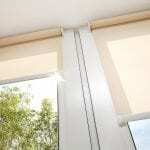 If you have pre-existing blinds installed and unsure if your blinds are safe and meet the Australian Child Safety Standards you can simply visit this website: https://www.productsafety.gov.au/standards/blinds-curtains-and-window-fittings and find more information. Or you can call us on 1300 88 36 37. We are happy to assist where we can as we take child safety seriously.